Woodworking has been my passion and my profession since 1971. I have made custom furniture, kitchen cabinets, built some houses, and made various accessories. But of all the woodworking I've done, turning bowls straight from the log is the most satisfying. It has allowed me to bypass the lumber company and create straight from the tree, using found objects, local woods. No two are exactly alike, and I'm able to exercise spontaneity and judgment in shaping each piece. I was born in 1950, and my earliest memories are images of a childhood in a poor coal mining town outside of Hazard, Kentucky. My father was a Presbyterian minister. In 1956 Mom and Dad packed my two sisters and me off to Brussels, Belgium, where we all learned some French. Then in 1957 we took the boat to the Belgian Congo, where Dad taught in a newly formed seminary on a remote station. It was true third world living. Then independence wracked the Congo and we evacuated to New Haven, Connecticut for two years. Then we returned for three more years in the new Democratic Republic of Congo. I went to a boarding school with 60 other kids, and had a blast playing among the mango and palm trees. From making do with little in Africa I learned to make my own toys, to build tools, to get by with what we had, and to love another culture. I developed self-sufficiency, self-reliance, and a distaste for TV consumer culture. After graduating from high school in Richmond, VA, I went to Eckerd College in St. Petersburg, Florida. When I was 19 I spent 6 weeks on an archeological dig in Israel. There was a strong focus on potsherds, for they are critical in dating the levels. 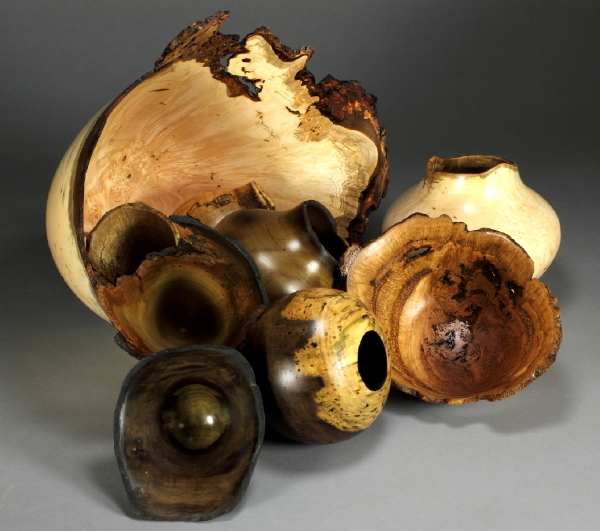 I have turned many bowls in the past with lips similar to some of those shards I picked up. I've also been long attracted to Navajo and Hopi pottery. Many of my globe shapes are derivative. I don't believe there are any shapes in wood that haven't been done millennia ago in clay. In fact, my first foray into building tools was a pottery wheel. But it didn't grab me. Wood does. In 1971 I dropped out to try working at Jonathan Jones Woodcarving. I quickly learned that I loved it all, from carving to painting to making simple furniture to building tools. In 1972 I married, and in 1973 we moved to West Virginia and began homesteading on 24 acres on a mountain top. We built a house, shop, greenhouses, solar heaters, drying kilns, kept goats and chickens. And, oh yes, we raised three children, Nathan, Ryan, and Rachel, all home schooled .... a very involving experience indeed. Fifteen years went right by. In 1988 we moved to Virginia, finding 9 wooded acres just west of Charlottesville that were appealingly close to the Skyline Drive, and recreated as much as possible the rural lifestyle which had been so life-forming in West Virginia. In 1997 I married Mary Rice, and the good life got better. My sons bought land about 8 miles away and have built their own homes there, and my daughter lives a bit south of Crozet near Mary's sister Amy. On the artistic side, I have been largely self-taught. For years my goal was to make wonderful furniture. I took some workshops, read, visited galleries, and whittled away. But I also turned some bowls off and on, and they always sold. Gradually I turned more and more bowls, enjoying the quick results and freedom of design that came with it. I've had one workshop with David Ellsworth and various others on furniture building. Mostly I've worked alone. If I'm an expert now, it's because I've made most of the mistakes there are to make. I rebuilt and rebuilt my lathe, making it larger, heavier, stronger, and going to a variable-speed motor. Sometime around 1996 I decided to do only bowls. I get a great deal of satisfaction from using all local and native woods, from staying close to home, and from creating objects of beauty out of rough materials. I focus on our local woods. Cut cleanly, polished smooth, dried to a stabilized state, and given a hand-rubbed finish, the thin arcs of wood display the character and history of each tree, bringing out the inherent beauty of figure and grain. Many pieces are meant to serve as functional salad bowls, while others are created simply for their artistic presence. 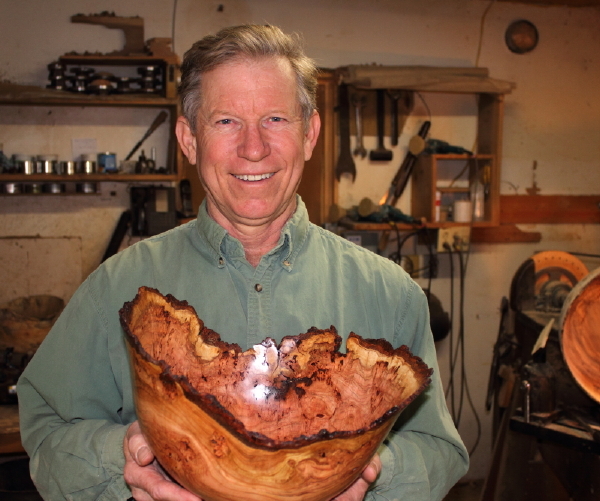 Here is a video of my bowl turning by my friend Scott Boven. And here is one shot during a demo at my studios. Our granddaughter Kaia Ruth at four months this May. Nathan is a freelance photographer and his work may be seen at www.explorationstudio.com. Rachel is growing and selling herbs and flowers, and her work may be seen at www.fairweatherfarmers.com. You can check out Ryan's fleece sewing business and hiking adventures at www.themouseworks.com . and his Sourwood Farm products Mary's sister Amy Webb is also self-employed with a fine business called Blue Ridge Floral Designs, supplying the greater Charlottesville area with lovely flowers for all occasions. http://www.blueridgefloral.com . 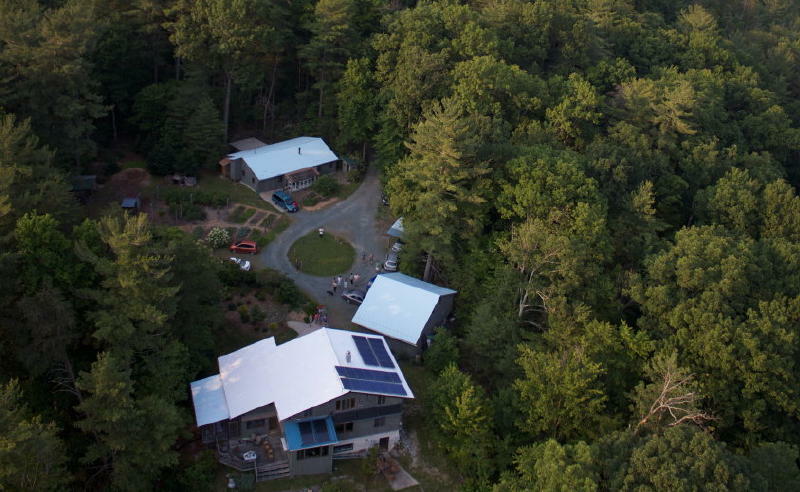 Here is our homestead in the woods, photo by Nathan Williamson using remote control helicopter. Note garden by studio, and solar thermal and photovoltaic panels on house. and our house in the winter. and the garden beside the berries. Some amazing poplar logs to work with. Loading a Norway maple log. A real van load of walnut. Some oak burl that wouldn't roll out of the van. A major van load of cherry and maple. And a wall of poplar shavings .... they really flew off.